Marfilous, under jockey David Alvarez, setting the fastest time for the $271,950 Grade 2 Firecracker Futurity at Delta Downs Saturday night. 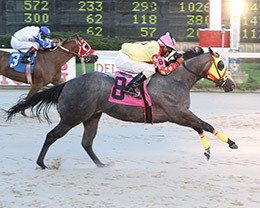 VINTON, LA�JUNE 11, 2016�Grade 3 Harrah's Entertainment Futurity finalist Marfilous qualified to her second straight graded stakes on Saturday night after posting an impressive three-quarter length winning effort in the first of six trials to the Grade 2 Firecracker Futurity at Delta Downs. The 10 fastest qualifiers, from 53 two-year-olds who participated in tonight's 350 yards trial races, will return to Delta Downs on Saturday, July 2 to vie for the winner's share of a $271,950 purse. Racing for owner/trainer Martin Trejo, Marfilous dueled fellow qualifier Leaveafamousmemory to get the top qualifying mark of :17.689 seconds into a 5 mph crosswind on a muddy (sealed) racetrack. Jockey David Alvarez rode the Texas-bred daughter of IVORY JAMES to her second win in three starts. Bred by Bobby Cox, from the Ocean Runaway mare Verrsace, Marfilous has earned $16,708. For a complete list of Firecracker Futurity qualifiers, times, sires, dams, owners, breeders, trainers and jockeys CLICK HERE.